Nikon has introduced a series of Magnifier, take anywhere, Nikon 16D 4x Pocket Magnifier optimized for convenient pocket carry. Nikon 16D 4x Pocket Magnifier feature coated, high grade optical glass lenses that slide out to deploy. Nikon 16D 4x Pocket Magnifier feature a stylish, marbled exterior finish. The Nikon 16D 4x Pocket Magnifier each utilize 1.3" diameter lenses. In the Nikon 16D 4x Pocket Magnifier, the lens is 4x and 16 diopter. The Nikon 16D 4x Pocket Magnifier are 2.7" long, 1.8" wide, and just under .6" thick. Both magnifiers weigh just over one ounce! 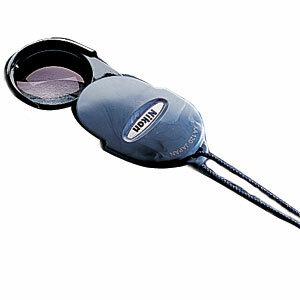 Nikon racquet-style magnifiers are full sized, bi-focal magnifying glasses featuring rubber armored, blue-colored grips with a special anti-bacterial coating. Nikon 16D 4x Pocket Magnifier incorporates specially developed anti-scratch coated aspherical lenses, retained in impact resistant, gray synthetic frames. Nikon 16D 4x Pocket Magnifier has Fine, coated optical glass. Nikon 16D 4x Pocket Magnifier is Pocket-sized, reliable magnification that goes anywhere. Nikon 16D 4x Pocket Magnifier has Attractive marble-pattern slide-in housing. Nikon 16D 4x Pocket Magnifier has All Nikon magnifiers are particularly suited to use by entomologists, coin collectors (numismatists), stamp collectors, fly fishing enthusiasts and anyone else who demands fine detail in his or her work or hobby. For more information about, Nikon 16D 4x Pocket Magnifier website.